Few herbicides are available for use in lettuce and more effective weed control tools are needed. Previous studies have found Prowl H2O (pendimethalin) to be safe to transplanted lettuce and effective on weeds that commonly infest lettuce fields. The study objective was to compare the safety and efficacy of pendimethalin applied to lettuce before (PRE) and after (POST) transplanting in commercial plantings and field station evaluations on the California central coast. Pendimethalin applied PRE transplanting resulted in little lettuce injury and provided acceptable weed control. Lettuce yields were not reduced by pendimethalin. While the level of injury was low with the pendimethalin POST transplant application, the PRE transplant application caused even less injury than the POST. Pendimethalin at 2.1 pt/Acapplied PRE or POST transplant controlled 68% and 53%, of the weeds, respectively, compared to 12% for Kerb (pronamide). In the commercial evaluations there was no difference in the numbers of marketable lettuce heads or head weights between pendimethalin and the hand weeded control. Results here show that pendimethalin has potential for use in transplanted lettuce and controls weeds as well or better than pronamide. The objective of this work was to determine the safety of PRE and POST applications of pendimethalin to transplanted lettuce and efficacy on common weeds of lettuce. Pendimethalin PRE and POST Applications. One month old lettuce plants (3 to 5 true leaf stage) were transplanted into twin row 40-inch wide beds. The in-row plant spacing was 9 inches, between row spacing was 12 inches and plots were one bed wide by 25 feet long. Prowl H2O 3.8 lb/Gal. (pendimethalin) was applied at 2.1 and 4.2 pts/A and Kerb 3.3 SC (pronamide) was applied at 2.5 pts/A PRE one day before transplanting and POST, one day after transplanting. The pendimethalin 2.1 pts/A treatment was included as the normal 1X rate, the 4.2 pts./A rate was included as a 2x rate to verify safety to lettuce. Each trial had a no herbicide non-weeded control and a weed-free control. Weed densities were measured in 2.8 ft2 sample areas about 3 weeks after transplanting. Crop injury estimates were recorded on a scale of 0% (no injury) to 100% (dead). Lettuce yield (fresh weights) was determined by harvesting a 9 feet long sample area from one plant line in the middle of the plot. Experiments were repeated in 2013 and 2014, and were arranged in a randomized complete block design with four replications. Injury, weed density and yield data were subjected to ANOVA and means were separated by Fisher's protected LSD at α ≤ 0.05. Commercial Field Evaluation. The on-farm evaluations were held with cooperating growers in Las Lomas and Santa Maria. Pendimethalin was applied PRE at 2.1 pts/A one day before transplanting. Lettuce yield in Las Lomas was sampled from an 18 ft long sample area on one bed (4 plant lines). 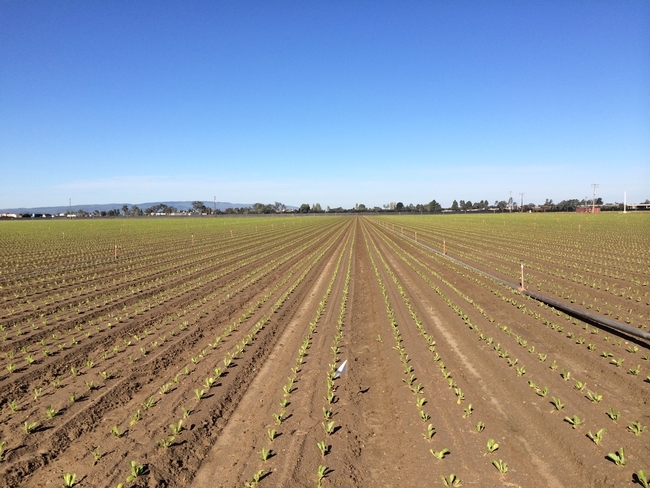 Lettuce yield in Santa Maria was sampled from one plant line by 30 feet long. The on-farm evaluations included a hand weeded control. Experiments were arranged in a randomized complete block design with three replications. Data were subjected to ANOVA and means were separated by Fisher's protected LSD at α ≤ 0.05. Pendimethalin PRE and POST Applications. The PREpendimethalinapplications at 2.1 and 4.2 pts/Awere safe for transplanted lettuce and resulted in minor crop injury of 12% or less (Table 1). POST transplant applications of pendimethalin resulted in 0 to 7% injury in 2013. POST applications of pendimethalinin 2014 resulted in 22% and 24% injury for the 2.1 and 4.2 pts/Atreatments, respectively. While the level of injury was very low, injury was more evident in the POST transplant pendimethalin applications than in the PRE transplant applications. Lettuce yields were not reduced by PRE or POST pendimethalin or pronamide applications relative to the nontreated control, indicating that transplanted lettuce plants have similar levels of tolerance to both herbicides (Table 1). The primary weeds in these experiments (average between 2013 and 2014) were 68% annual sowthistle (Sonchus oleraceus L.), 12% shepherd's-purse, 10% burning nettle (Urtica urens L.) and 8% hairy nightshade (Solanum physalifolium). Under high weed densities in 2013, pendimethalin at 2.1 pts/Aprovided 69% and 53% weed control respectively in the PRE and POST transplant treatments (Table 1). By comparison pronamide provided 12% and 39% weed control respectively in the PRE and POST transplant treatments. Annual sowthistle was the main weed in 2013; a species poorly controlled by pronamide. Hairy nightshade was the main weed in 2014, a species well controlled by pronamide, and the reason why pronamide performed better in 2014 than 2013. Table 1: Injury estimates, transplanted lettuce yield (fresh weights) and total weed control resulting from pendimethalin PRE and POST applications, in 2013 and 2014 on the field station evaluations. Note: yields were combined for 2013 and 2014.
a Means with the same letter within columns are not significantly different according to Fisher's Protected LSD at P < 0.05.
b Visible injury estimates were taken 15 and 25 days after treatment for the 2013 and 2014 experiments, respectively; estimates were taken on a scale of 0%-100%, with 0% = no injury and 100% = dead plants. c Yield was evaluated 48 and 59 days after treatment for the 2013 and 2014 experiments, respectively. d Weed control was measured 25 and 23 days after treatment for the 2013 and 2014 experiments, respectively. The main weeds in this experiment were 68% annual sowthistle, 12% shepherd's-purse, 10% burning nettle and 8% hairy nightshade. Commercial Field Results. Evaluations of pendimethalin in commercial fields found similar results to the research station evaluations. At both locations, there was no significant difference in the numbers of marketable lettuce heads or yield between pendimethalin and the hand weeded control (Table 2). 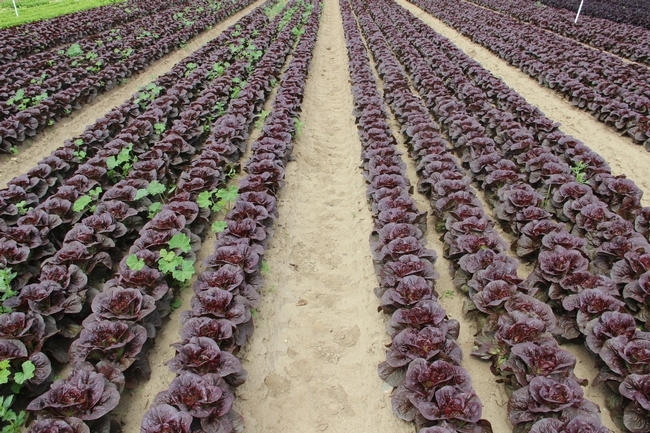 Differences in yield between locations were mainly due to differences in lettuce varieties and corresponding cropping practice such as plant densities. Table 2. Transplanted lettuce yield, number of marketable heads and fresh weights, from the on-farm study of pendimethalin held in Las Lomas and Santa Maria in 2013 and 2014, respectively. a There were no differences between the treatments according to Fisher's Protected LSD at P < 0.05. We concluded thatpendimethalin (PRE and POST) at 2.1 pts/Awas safe for use on transplanted lettuce, and resulted in better weed control than pronamide. For transplanted leaf lettuce, pendimethalin is a viable product and registration of this product on lettuce should be pursued. Acknowledgments: Thanks to California Leafy Greens Research Board for funding this study and Craig Sudyka, Betteravia Farms and Jason Gamble, Babe Farms, Santa Maria for their collaboration in Santa Maria studies.